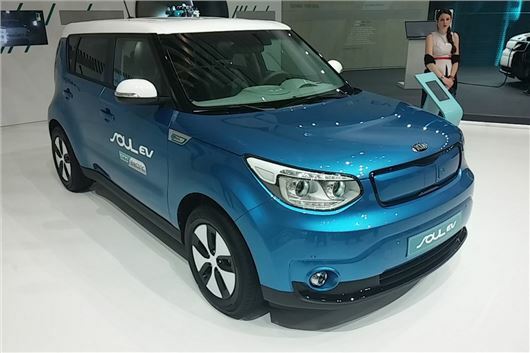 The Kia Soul EV made its European debut in Geneva, adding to the options for buyers looking to make the switch away from conventional petrol and diesel cars. Significantly, the company's first electric car will be offered with the same warranty as with all other Kia models and has a claimed 124-mile maximum range. It's based on the next generation Soul - also due this year - so should prove practical and spacious. The electric motor produces 109PS with 285Nm of torque from zero revs so performance should be strong. From empty the Soul EV can be fully charged in less than five hours via a 240v outlet, or up to 80 per cent charge in around 30 minutes from a fast charger. The car has one forward and one reverse gear, so acceleration from 0-62mph is seamless and takes around 12 seconds. Top speed is 90mph. At higher speeds wind and tyre noise is more noticeable in EVs because there is no engine noise, so additional sound-proofing material is installed in the Soul EV. At speeds below 12mph, because of the silent-running nature of EVs, the Soul emits a ‘virtual engine sound’ to alert anyone nearby that there is a car coming. However it does get some unique design details, including a larger, closed grille to accommodate the charging port, plus coloured trim details. It also gets unique 16-inch alloy wheels with low-rolling resistance tyres. Initially three colour options will be available, all of which feature two-tone paint. These will be - blue with a white roof, white with a blue roof and silver with a white roof. The car will initially be sold in the US before arriving in the UK in late 2014. As with every other Kia model, the Soul EV come with a seven year 100,000 mile warranty. The Soul EV is due to arrive in the UK later this year, prices should be around £25,000.